As part of the continuous efforts to enhance the laboratory’s value-added services, Beta Analytic now provides C:N, %C and %N measurements on collagen extracted from non-cremated bones in addition to δ15N and δ13C stable isotope analysis at no additional cost for samples sent for radiocarbon dating. Collagen quality is assessed using %C, %N, C:N, δ13C and δ15N values measured on the sample. These analyses are also available without radiocarbon dating for a fee. These values are often utilized to determine the diet, paleodiets, trophic levels and paleoenvironments associated with the bone samples. Beta Analytic offers two services for bones – standard and priority. Both services use Accelerator Mass Spectrometry (AMS) technology, which gives the most advanced precision and accuracy. For standard AMS dating service, results are reported in 14 business days or less. For priority, results are available between 4-7 business days. For non-cremated bone samples, Beta Analytic provides conventional collagen extraction techniques and subsequent ultrafiltration methods if requested. Ultrafiltration consists of filtering the collagen through ultra-fine filters at high revolutions per minute as an additional measure to remove humic acids. Additional fees apply if ultrafiltration is requested. The laboratory highly recommends sending bone samples rather than extracted collagen for radiocarbon dating or stable isotope analysis. Extracted collagen will be listed as “organics” in the final report instead of “bone collagen” as required by the lab’s ISO/IEC 17025:2005 accreditation. If the lab did not perform the chemical pretreatments and/or extractions, it cannot specifically testify as to the material that was analyzed because certain steps affecting the sample quality have been outside of its control and scope of the accreditation. Located in Miami, Florida, the ISO 17025-accredited laboratory is the only natural-level radiocarbon dating facility in the world offering a turnaround time between 3-14 business days. Beta Analytic does not accept biomedical samples or any material containing artificial Carbon-14 to eliminate the risk of cross-contamination. Moreover, the lab does not engage in “satellite dating,” the practice of preparing individual sample graphite in a remote chemistry lab and then subcontracting an AMS facility for the results. The lab provides clients with quality assurance reports, unlimited technical consultation, and 24/7 web access to past results and pending analyses including photos of samples analyzed. Client support is available in 10 languages. Beta has price lists in different currencies. To get a complete quotation, please indicate the chosen service (AMS Dating standard or priority), the type of bone sample (non-heated, charred, cremated), number of samples and billing address of the paying company or university. Extended counting for micro samples is included in the price. The lab has removed a number of cancellation fees for samples that are too small for AMS dating. 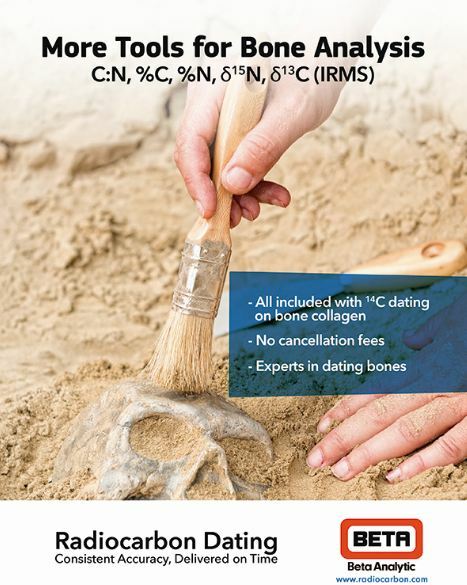 Beta Analytic’s radiocarbon dating fees for non-cremated bones are inclusive of δ13C measurements by Isotope Ratio Mass Spectrometry (IRMS) and calendar calibration, when applicable. Its stable isotope analysis laboratory also measures δ18O for carbonates, and δD (deuterium) and δ18O for water. The lab also provides stable isotope analyses on a standalone basis. For details on stable isotopes analysis and radiocarbon dating prices, please email the lab using this contact form. This entry was posted on Friday, July 15th, 2016 and is filed under Uncategorized .